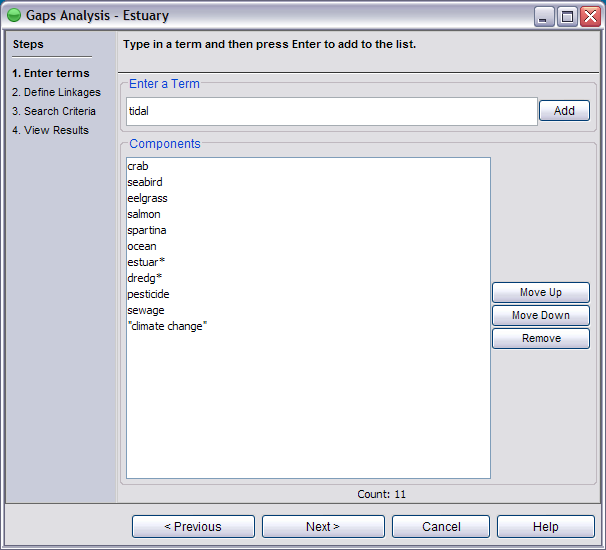 Terms (including phrases) are entered to represent ecosystem elements. Enter in each term that you want to represent as a component in your ecosystem. Click Add to add each component (term) to the list. In the example above the term crab is entered to represent the ecosystem’s first component. Once the user pushes Add, crab is added to the list of components. dredg* - Wildcard matching. Will match dredge, dredges, dredging, etc. You may also use a question mark to have wildcards on a single character. Ex: ?ild* will match words like wilderness, wild or oildrum. "lobster trap" - Phrase matching. Matches the exact phrase in between quotes. water ocean creek lake stream - Conditional matching. Will match any of the terms listed (like saying, "water or ocean or creek or lake or stream"). Use the Move Up and Move Down buttons to change the order of the elements. Once all components are added for your ecosystem model and are in the correct order, click Next.